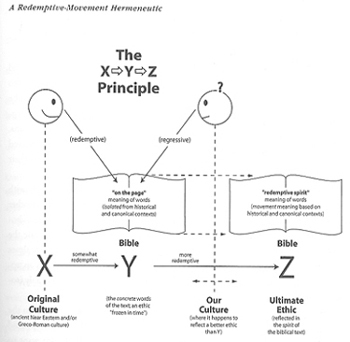 Yesterday I wrote about the Redemptive Movement Hermeneutic. Today I thougt I would share a diagram that William J. Webb used to illustrate the idea. It comes from "Discovering Biblical Equality: Complementarity Without Hierarchy," page 383. A few years ago I learned that I have a Redemptive-Movement Hermeneutic. (Not to worry. They tell me that with surgery and proper medication it can be treated.) A hermeneutic is the “lens” we look through to read scripture. This lens involves our understanding of God and his purposes in giving Scripture. It involves our perceptions of the authors. It involves cultural assumptions we bring to the text from our own experience. We all engage in hermeneutics but we usually do it without reflection. It is taken for granted. Years ago I began to realize that theologically conservative Christians and liberal Christians have something in common. Their hermeneutics assume Scripture is static. The conservative perspective views Scripture as a once and for all time “blueprint” for humanity. It is often referred to as a “manual for living” or “God’s plan” for our lives. In my estimation, there is often a lack of appreciation for cultural context within this perspective. The liberal wing of the church tends to see Scripture as a collection of inspired (if that) human documents written by fallible authors. Scripture offers us very general principles about things like love and worship, but it is not much use for giving guidance in contemporary living. Human reason and knowledge have advanced so far beyond biblical understandings that all we can truly glean are the broadest of principles. We place ourselves above Scripture to interpret it. In my estimation, this perspective lacks appreciation of the divinely inspired nature and preservation of Scripture. It undercuts the authority it has over our lives. My concern with both of these perspectives is that they are static and not dynamic. William J. Webb is the one I stole the “Redemptive-Movement Hermeneutic” label from. He uses an “XYZ” formula. X stands for the particular culture context a Scripture passage was written in. Y stands for the concrete words of Scripture and the ethic they teach in contrast to culture. Z stands for the ultimate ethic the God intends for eternity. Redemptive-Movement begins with the creation and fall. It understands God to be redeeming humanity and creation over time, until one day all realms will be united under his authority. There is a progression, not a flip of a switch, from fall to full redemption. God is shaping things toward a predetermined end. Therefore, when I read a passage of Scripture, I have three questions to keep in front of me. Question X - What was the nature and practice of the surrounding culture? Question Y – What exactly is the biblical passage saying and how does that contrast with the surrounding culture? Question Z – What is the ultimate ethic to which the biblical passage is pointing? (X) The “seven-fold vengeance” said that what ever wrong you do to me I will repay seven times worse. This excessive vengeance was prevalent in the ancient Middle-East. (Z) Jesus told us to love our enemies. The “eye for an eye” standard was to limit violence. It was not the ultimate standard but it pointed us in the direction of the ultimate standard. To act on an “eye for an eye” mentality now would be a regression from the standard. The ultimate ethic as clearly articulated in Scripture for this issue. This is not the case on many other issues. For instance, no where in Scripture does it explicitly say to end slavery and there were slaves in New Testament churches. To return to New Testament ethics would be a reversion from an ultimate ethic. My aim in following posts is to think about globalization using this hermeneutic.